See more objects with the tag turbans, heads, portrait, jewelry, clothing, nobility, mantle, Nasca, tatoos. See more objects with the color saddlebrown darkolivegreen dimgrey or see all the colors for this object. This is a Mantle fragment. It is dated 400–100 BC and we acquired it in 1951. Its medium is wool and its technique is plain weave with discontinuous warp and weft (tapestry) interlocked. It is a part of the Textiles department. 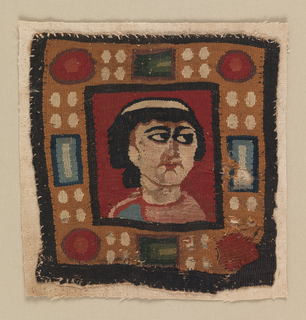 The production of this type of cloth was confined to a brief period of great artistic achievement in the Nasca region. 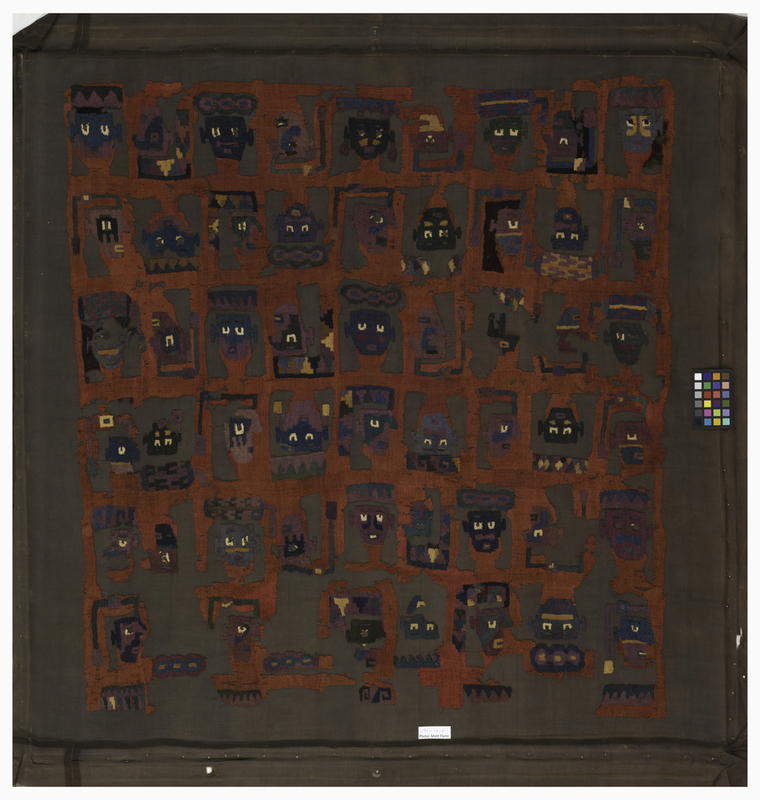 The portrait heads appear to be of human rather than deity figures, and seem to represent individuals of varied status and perhaps ethnicity, signaled by the wearing of certain accoutrements. Features of the figures include turban-style head wrappings, various types of nose and ear ornaments, and facial features that may represent painting or tattoos. Those shown in profile may be captives, representing the achievements of the frontally-depicted warriors. The small scale of the design links it to a very limited number of related examples. Woven in the technique of discontinuous, interlocked warps and wefts, the beautifully dyed colors of are each woven only within their design areas, sometimes only a few threads wide. The weaver had to link each section to its adjacent color area, forming a kind of mosaic cloth. Most textiles woven in this technique use simple design elements such as squares or stepped forms, making use of the grid dictated by the perpendicular warps and wefts. Here, the small-scale, curvilinear designs require an expertise not seen in other parts of the Andes.